Denon has given the AVC-X8500H a very sturdy case with solid side panels, a reinforced ceiling and generous aluminum front panel and solid aluminum front door to give the new top model a correspondingly high-quality appearance. The two big knobs have also been redesigned, and the display technology has been taken over from Denon’s NE series. It can be assumed that all the features already known from other current Denon AV receivers also belong to the functional scope of the AVC-X8500H. Special attention deserves therefore here primarily the announcement of the HDMI 2.1 support. Although this is not activated at least for the time being, the hardware but brings the receiver but apparently already and a speedy firmware update done, according to Denon the rest. Part of the new HDMI 2.1 specification is the potential support of resolutions up to 10K, 4K signals with 120Hz refresh rate, 8K signals with 60Hz refresh rates can be transmitted. Furthermore, variable refresh rates are also supported – this is interesting, for example, for gaming applications. Also officially codified for the first time is the transfer of dynamic HDR metadata. This works in the case of Dolby Vision already, but only with a trick – a long-term and universal solution was still pending. The new eARC (Enhanced Audio Return Channel) now also redirects 3D sound formats. It is expected that this will apply to both Dolby Atmos and DTS: X. Thus, the Denon AVC-X8500H is one of the first devices that are equipped for upcoming formats, while the latest HDMI standard is of course fully backward compatible. Also noteworthy are the audio features of the new AVR model. 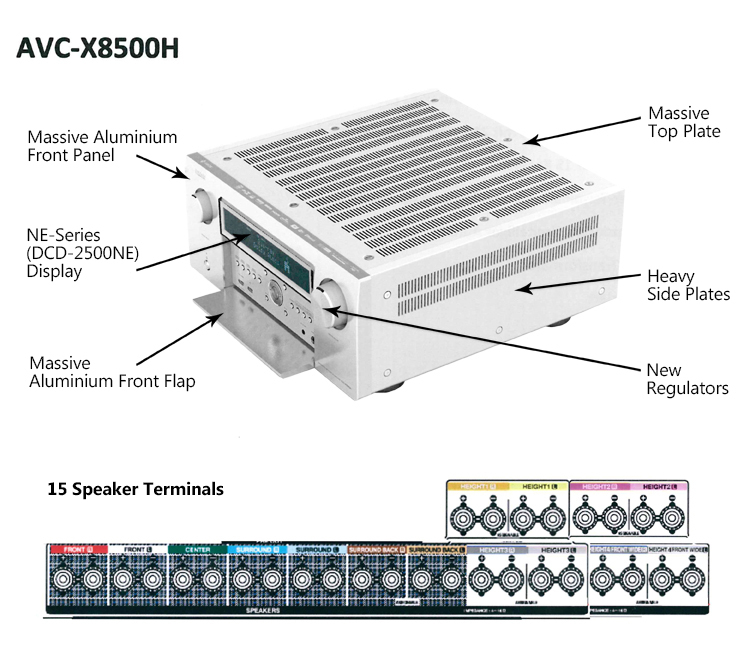 Overall, the AVC-X8500H has 13 built-in power amplifiers that can be routed through the software to 15 speaker jacks. Thus, in theory, different setups can be wired and then flexibly selected as needed – perfect for more complex Dolby Atmos, DTS: X or Auro 3D configurations. In addition, there are two subwoofer outs as well as numerous other inputs and outputs, but here we have no specific information. Denon will also be shipping the MultEQ Audyssey XT32 calibration tool to the AVC-X8500H, and the AV receiver is apparently ISF-certified. In addition, of course, the in-house multiroom system Denon HEOS on board as well as Bluetooth and Apple AirPlay. That should suffice for a first overview. As soon as we get more detailed information about the AVC-X8500H or the device arrives at our demonstration, we will point this out at this point. UPDATE: Earlier we had published that the Denon would be released in February, unfortunately this is not the case.